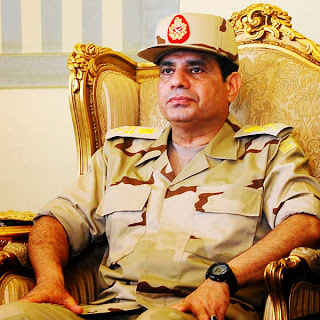 August 25, 2013 — General Abdel Fattah el-Sisi, Commander-in-Chief of the Egyptian Armed Forces and the Egyptian Ministry of Defense, has warned the Ethiopian regime of military action if they continue to build the Grand Ethiopian Renaissance Dam, according to local Ethiopian newspapers. In a brief telephone call made on Saturday, General Sisi reiterated his country can not afford to lose even one drop of Nile water and warned Ethiopian officials that his military is prepared to use force if they did not abandon their plans for the controversial dam. Egypt, which receives the fewest annual rainfall in Africa, is concerned that the dam project would damage its ability to deliver drinking water to its over 85 million population. But Ethiopian officials have cemented their position of late and refuse to consider Egypt's dire water shortages. “The Renaissance Dam is here to stay. It is advisable for all actors of the political establishment in Egypt to come to terms with this reality,” said Getachew Reda, a spokesman for Ethiopian Prime Minister Hailemariam Desalegn. Adding more sense of urgency for Egypt, Ethiopia announced a few weeks ago that it had begun the process of diverting the course of the Blue Nile River to its dam, raising fears over Egypt’s long term water security and stability.